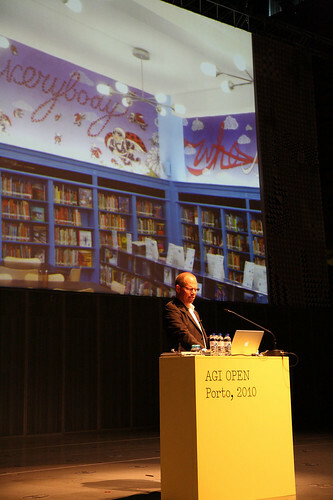 However Porto is a vibrant town with an eager student population, an energetic cultural life and a few excellent graphic and typographic studios, the best known of which is R2, run by Lizá Ramalho and Artur Rebelo (below), who have taken on the gargantuan task of organising not just the AGI’s yearly convention and exhibition but also Monday’s AGI Open, the organisation’s first conference open to non-members. 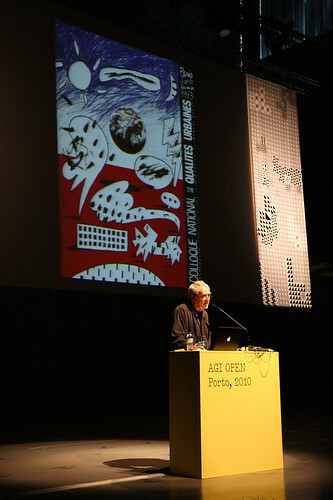 The location was the Casa da Musica (top, designed by Rem Koolhaas) and the dense and varied programme included Korean designer Ahn Sang-soo; French and Swiss design icons Pierre Bernard, Peter Knapp and Bruno Monguzzi; current AGI President Paula Scher and two of her partners at Pentagram in NY, Abbott Miller (below) and Michael Bierut; plus two of the design heroes today’s students admire most: Marian Bantjes and Stefan Sagmeister. 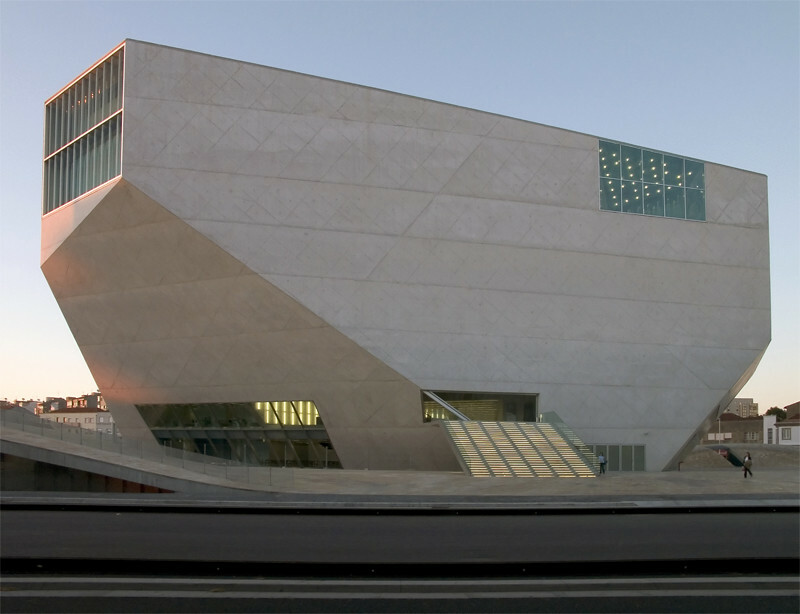 Entrance fees were kept exceptionally low, in view of the economic situation in Portugal – with a full house as a result. Most of the speakers actually stuck to the theme, ‘Process is the Project’, allowing their audience a peek behind the scenes, offering them a glimpse of things that may never appear in magazines or coffee-table books. 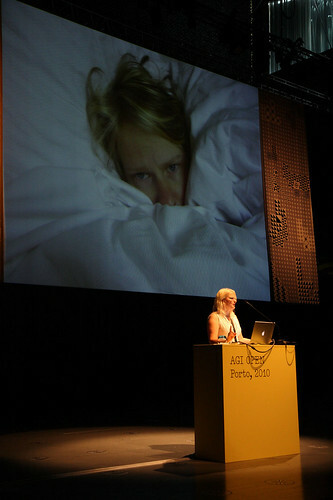 Bantjes (above) was among the speakers who took the brief all the way, showing photographs of the places where her ideas are generated (bed, couch, bath tub) or executed (kitchen table). She also zoomed in on the details of a rejected magazine cover. Pierre Bernard (above) reminded the audience in the uniquely flavoured English of a thoroughly French intellectual that good design can only take place when the designer appropriates the assignment and gets deeply involved in the subject matter, and the client ‘gradually loses exclusive ownership of the brief’. Michael Bierut (above) discussed his work on a New York school library project, analysing the pitfalls of designer arrogance and impatience (jumping to conclusions about the project at hand, proposing standard solutions rather than looking at whom the project really addresses). What was possibly most revealing to many young designers was that graphic design is often about much more than design. 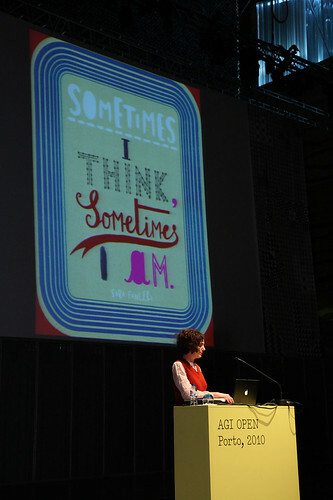 It can involve an understanding of literature, as in the book covers by A2’s Henrik Kubel; a playful, personal philosophy of the world, as in Sara Fanelli’s illustrative designs (above); a confrontation with dance and movement, as in Cyan’s designs and image-making for Berlin’s Compagnie Toula Limnaios. 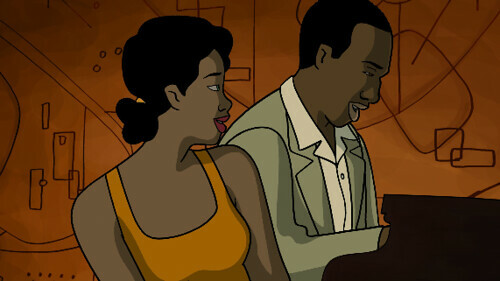 Or it can involve three years of research into past and present cityscapes and musical cultures, as in Estudio Mariscal’s forthcoming animated feature film Chico & Rita (above and below). This movie was probably the conference’s biggest scoop. Set in 1940s Havana and New York, with an original soundtrack, the film is in a genre of its own. It will première in November. At AGI Open, a lovingly produced ‘making of‘ was glowingly presented by Javier Mariscal’s brother Tono Errando. 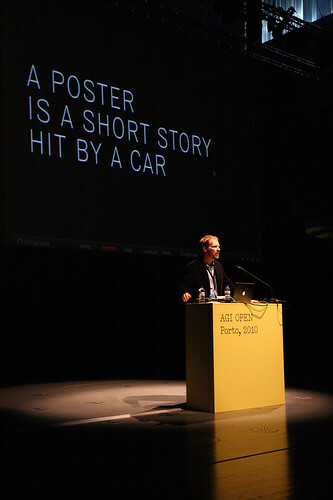 If a conference is intelligent, and the speakers experienced – and this first AGI Open was about as good as it gets – attending it can be a defining experience for a young designer. 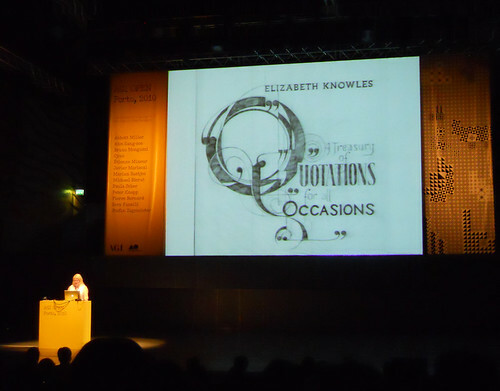 ‘Inspiring’ is a much-abused word, but yesterday was just that – one of the most intense design events I have witnessed. The exhibition ‘Mapping the Process’ is from 15 October–10 November 2010. 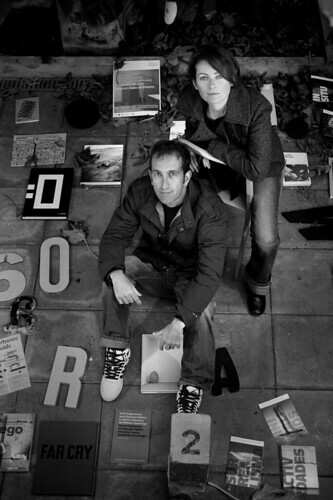 See ‘The word on the street’ (about a typographic project by R2) in Eye 70. Read the Reputations interviews with Marian Bantjes in Eye 72 and with Pierre Bernard in Eye 3. Eye magazine is available from all good design bookshops and at the online Eye shop, where you can order subscriptions, single issues and back issues. The Autumn issue, Eye 77, now on press, features a Reputations interview with Paula Scher.